I hadn't been here since the 1995 Rugby World Cup Final but popped in for a late, swift one. Actually not bad and a pint of Jugged Hare, in a handled glass, was excellent. Expensive as you would expect of the location but that's more the fault of George Osborne than the proprietors. Have not been here in quite some time will not be returning, just been short changed 5 pounds. Dreadful dreadful dreadful...how to make yourself invisible...be a man over 50, go into this pub and try to get served. The bar staff are more interested in chatting amongst themselves, but when they do deign to serve customers, anyone over 35 is completely ignored. My money is just as good as a younger person's money but apparently this pub doesn't think so. I used to think that this pub was OK but will never bother with it again. 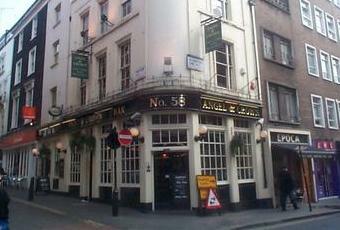 If you're a grumpy old git like me, try the Bear and Staff in Charing Cross Road instead! The pub has very recently re-opened after what looks like a substantial renovation. Have yet to visit to see what changes there have been, and if the cask ale has improved (it's been occasionally good, but not consistently).